Well, I awakened shortly after this M 6.4 earthquake hit the northern part of Alaska, along the north Slope, north of the Brooks Range. My inbox has had a lower frequency of USGS ENS notifications since Kilauea has settled down somewhat. However, today, the aftershocks just keep rolling in. Those who are on the north slope are getting rattled for sure. 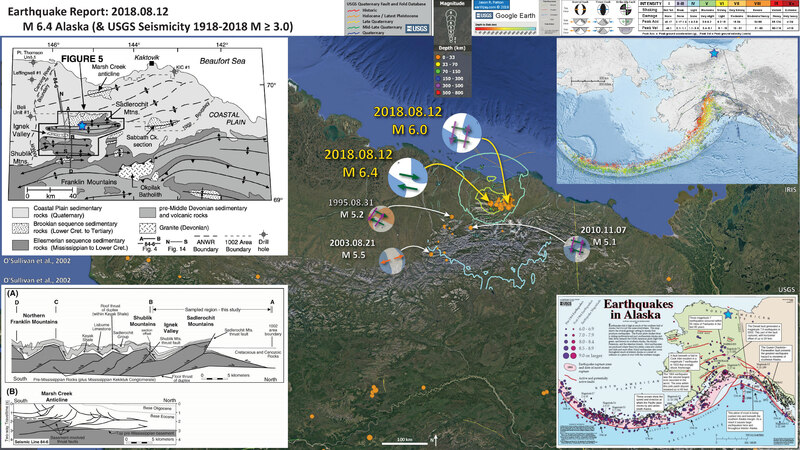 I have had to reproduce my seismicity maps several times as the epicenters keep getting updated (thanks USGS). The two largest earthquakes are now actually aligned with the west northwest strike of the earthquake. There are no active faults mapped in the region of today’s earthquakes. There is a series of thrust faults that form the mountains in this area (e.g. the Sadlerochit Mountains). To the north is a Quaternary active fold (the Marsh Creek anticline), however, this structure is too far away to be related to today’s activity. The interesting thing is that today’s series of earthquakes are strike-slip earthquakes. It is possible that one of these thrust faults has been reactivated as a strike-slip fault (but they are probably dipping too shallow to do this). So, i suspect that these earthquakes are either on an un-mapped active fault or are distributed throughout the region on a variety of different faults (seems more likely, but I would defer to those who are studying the tectonics on the North Slope to be more informed about this). These earthquakes remind me of the 2002 dextral (right-lateral) strike-slip Denali fault earthquake. More on the Denali Earthquake can be found here too. 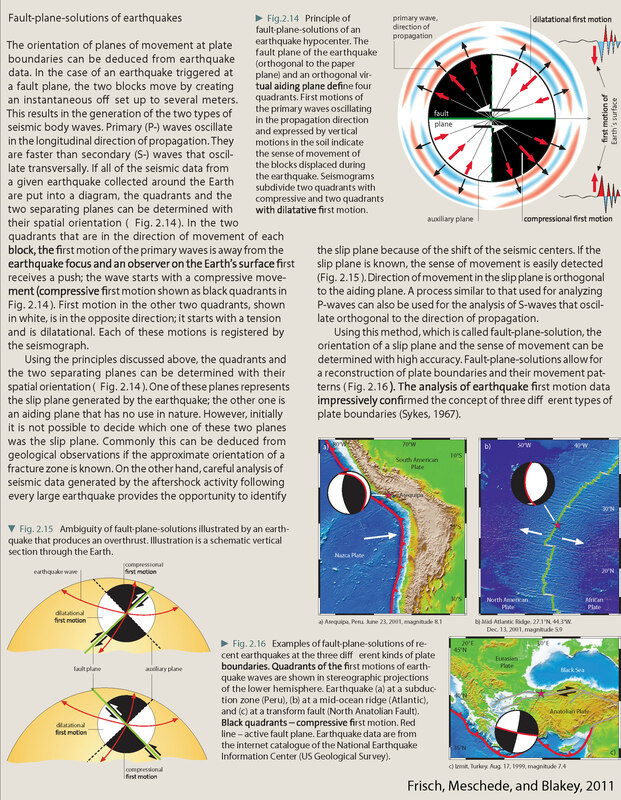 I include a second poster below that has more details about the regional geology. On this map I include faults and folds from the Alaska Quaternary Active Faults and Folds database (Keohler et al., 2013). Based upon the seismicity, I interpret these earthquakes (at least the ones with mechanisms) as east striking right-lateral strike-slip earthquakes. The historic earthquakes are not as easy to interpret, so I include both nodal plane solutions as being possible. However, if they are related in some way to today’s seismicity, they are probably also right-lateral strike-slip earthquakes. 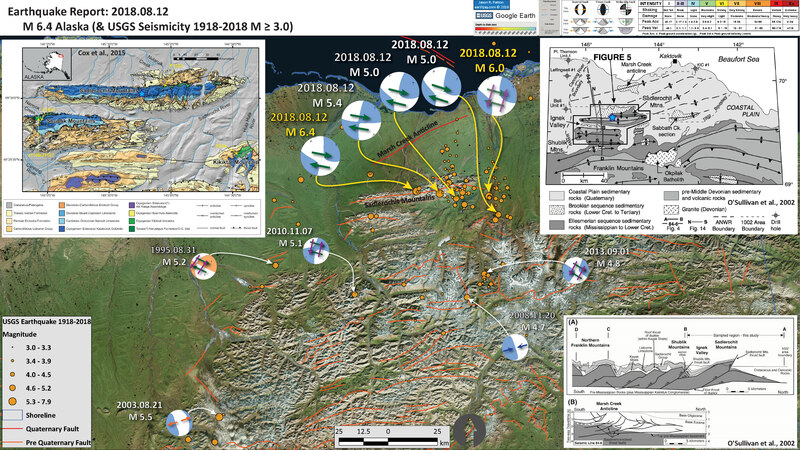 In the upper right corner is a map from IRIS that shows historic seismicity in the Alaska region. Color represents depth. One may visualize the subduction zone as shallower earthquakes are green in color and the deeper earthquakes are red in color. 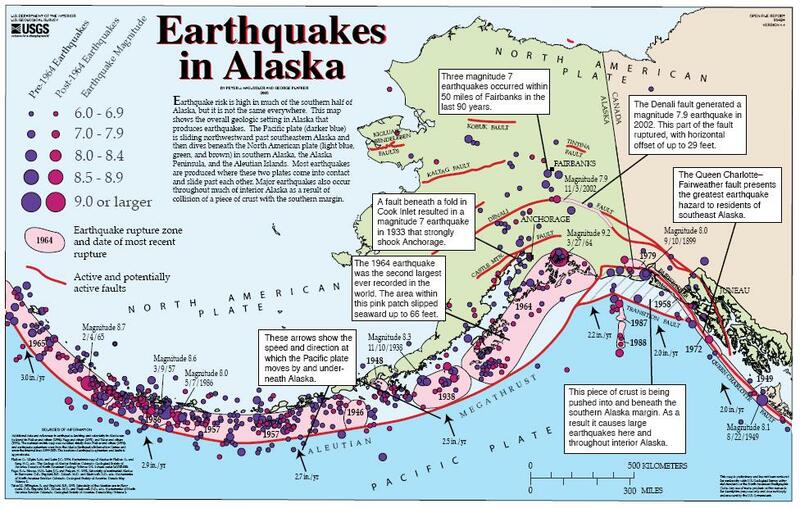 In the lower right corner is a USGS map showing the major historic earthquakes in Alaska. Most of these are subduction zone earthquakes, however, the 2002 Denali Earthquake also shows up. This was a right-lateral strike-slip earthquake on the Denali fault. I place a blue star in the general location of today’s first M 6.4 earthquake. In the upper left corner is a large scale map showing the tectonics on the eastern North Slope (O’Sullivan et al., 2012). This map shows the anticlines and thrust faults. Anticlines are folds in the crust that are formed by compression, with the fold being pushed upwards (viewed from the side, it would look like a frown). The thrust fautls are symbolized with triangles pointed in the direction down dip (into the earth). There is a thrust fault on the north flank of the southern of the two anticlines in the Sadlerochit Mountains. In the lower left corner is a cross section showing how these thrust faults and anticlines are possibly configured (O’Sullivan et al., 2012). Here is the larger scale map showing more detail. This includes faults from the Alaska QFF (Koehler et al., 2013). I include a shaded relief map as a base map. I also include the state geological map (Wheeler et al., 1997), colored relative to the age of the geologic unit. UPDATE This is the same map with ESRI imagery as a basemap. 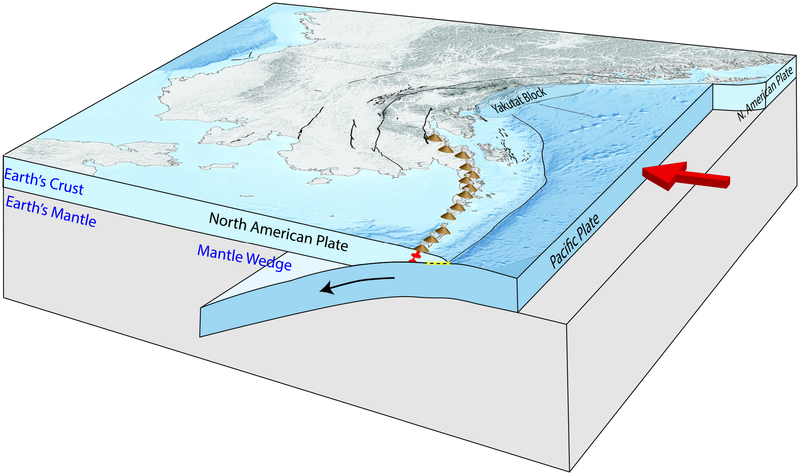 Here is an informational video from IRIS explaining the tectonics in Alaska. There is a paucity of information about the geology of the north slope in this video, but it is still very educational. 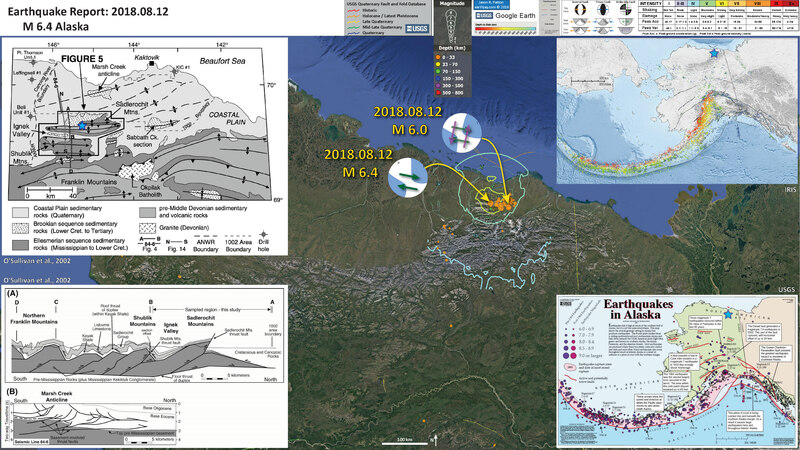 Here is the USGS mpa showing historic earthquakes in Alaska. 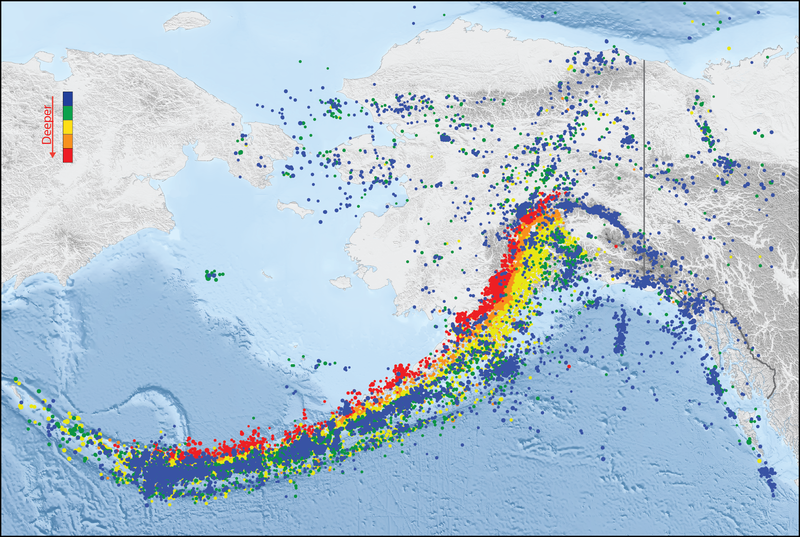 Here is the IRIS map showing seismicity relative to depth (color). This is the low angle oblique view of the Alaska-Aleutian subduction zone. 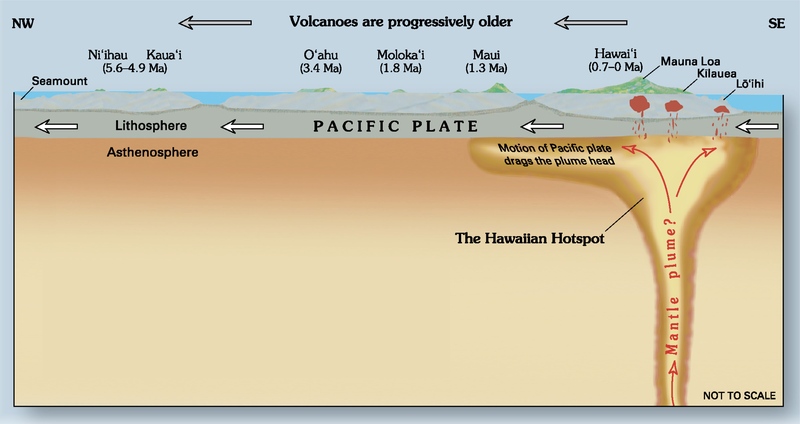 Note how the downgoing Pacific plate subducts beneath the North America plate. Below are 3 figures from O’Sullivan et al. (2012) that present their interpretations for the tectonic structures along the eastern portion of the North Slope in Alaska. Here is their intro overview map. The second map below is outlined here. Generalized geologic map of northeastern Alaska, showing the location of the Arctic National Wildlife Refuge (ANWR), the northeastern Brooks Range, and other features specifically mentioned in the text. This is a larger scale map showing the details for the structures in the area. The cross section locations are labeled here. Tectonic map of the northeastern Brooks Range, showing the location of the Sadlerochit and Shublik mountain ranges, Ignek Valley, the Beli Unit #1 well, seismic line 84-6, and other features mentioned in the text. Map modified from Wallace and Hanks (1990). This is a cross section showing their interpretation of how these thrust faults relate to each other. Note the lack of a strike slip fault in this area. Presentation of known structures recognized within the Sadlerochit Mountains region. (A) Balanced cross section through the northern part of northeastern Brooks Range (modified from Wallace, 1993). Each basement-cored anticlinorium is interpreted to mark a horse in a duplex formed above a detachment at depth in basement (dark shading). The roof thrust in Kayak Shale terminates to north in the Sadlerochit Mountains owing to depositional discontinuity. All structures shown are interpreted to be Cenozoic in age. (B) Reproduced interpretation of seismic line 84-6 by Potter et al. (1999, plate BD2), indicating that basement rocks were involved in deformation beneath the coastal plain to the north of the Sadlerochit Mountains (at same scale as A). Here is a map from Cox et al. (2015) that shows some detailed geologic mapping in the region. Simplified geologic map of the Shublik and Sadlerochit Mountains, northeastern Brooks Range, Alaska. The Kikiktat volcanics are shown in green and outcrop in the hanging wall of large N-directed Cretaceous–Tertiary Brookian thrust sheets. Geologic is mapping by Strauss and Macdonald, with modifications from Robinson et al. (1989) and Bader and Bird (1986). Ground shaking from the M6.1 #Alaska earthquake was easily recorded on NRCan seismic stations form coast to coast to coast (from Inuvik to Victoria to Halifax). The seismic surface waves only took ~20 minutes to travel to Nova Scotia. Shallow, crustal earthquakes are extremely common throughout Alaska and do not indicate induced seismicity. The crustal, strike-slip mechanism for this quake aligns with previous earthquakes in the area and is completely consistent with a natural source. Another M6.4 earthquake in Alaska, just to the NNE of the one earlier this morning. These recordings of the shaking at Inuvik and #Victoria a few minutes ago. Cox, G.M., Strauss, J.V>, Hlaverson, G.P., Schmitz, M.D., McClelland, W.C., Stenenson, R.S., and Macdonald, F.A., 2015. Kikiktat volcanics of Arctic Alaska—Melting of harzburgitic mantle associated with the Franklin large igneous province in Lithosphere, v. 7, no. 3, p. 275-295. Koehler, R.D., Burns, P.A.C., and Weakland, J.R., 2013. 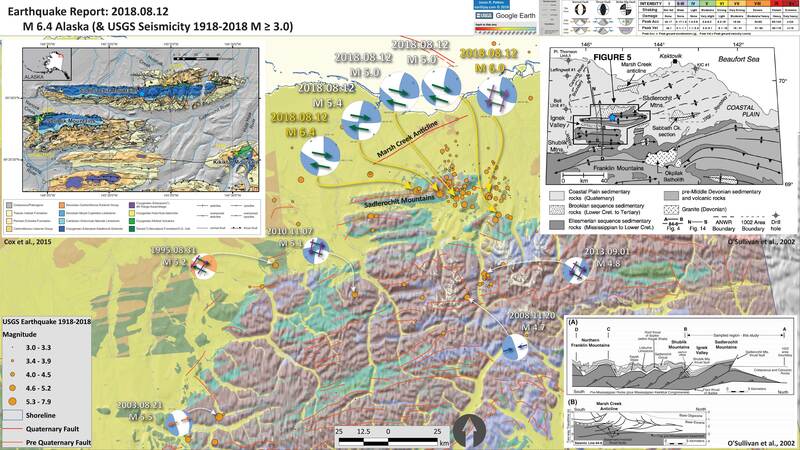 Digitized faults of the Neotectonic map of Alaska (Plafker and others, 1994): Miscellaneous Publication MP 150, Alaska Division of Geological & Geophysical Surveys, Fairbanks, AK, USA. Wheeler, J.O., Hoffman, P.F., Card, K.D., Davidson, A., Sanford, B.V., Okulitch, A.V., and Roest, W.R. (comp.) 1997. Geological Map of Canada, Geological Survey of Canada, Map D1860A.